Frozen grapes are a classic summer treat in my family, and so easy to make. It’s better if you take the grapes off the stem, but if you’re having a bit of a lazy day, you can skip it. Just clean them off first, dry, put in a container and freeze. If your kids find fully frozen grapes too much to handle, let them take out a small bowl and have it sit for a little while to defrost a touch. Published by Stephanie, in Recipes. 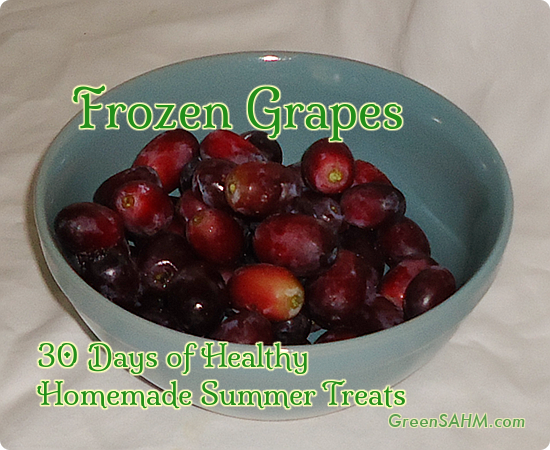 Tagged with 30 days of, frozen grapes, healthy homemade treats, summer.